"Since coming to your center, A. has found himself. He is at peace, confident and excelling in his studies. Before coming to the centre he would be withdrawn, now he willingly takes on problem solving. Now he is willing to find solutions to his problems as well as wanting to help others." "I could never explain to you how much you have helped me. You have truly changed my life. I don't know where i would be without you. I'm so greatful for what you have done. I am more organized. I can concentrate. I'm not easily irritated and distracted. I'm not afraid to voice my opinion"
"I'm more aware of what is going on around me and not as easily overwhelmed by others. I am better able to assert myself in moments of difficult interaction. I feel more rested and am able to excercise more." "I am less fatigued and less anxious. I have discovered parts of me that I never knew existed. I am pursuing interests that have opened up new worlds for me. My life is more focused, organized, and fun. I have a greater sense of self and greater confidence. I never expected to find the artist in myself." 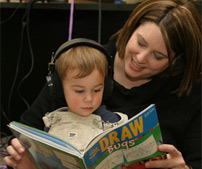 "Our overall experience with creative listening center has been great. A. has improved in many areas. He has gained focus, improved with reading, writing, and math. His coordination with both large and small motor has improved. Animal fears and some noise fears have improved. He remembers names and recalls events." "B. is much calmer, happier and listens better. She is able to complete her homework much faster and with ease. Her spelling has improved. She is able to express herself better. Her friendships are improving.